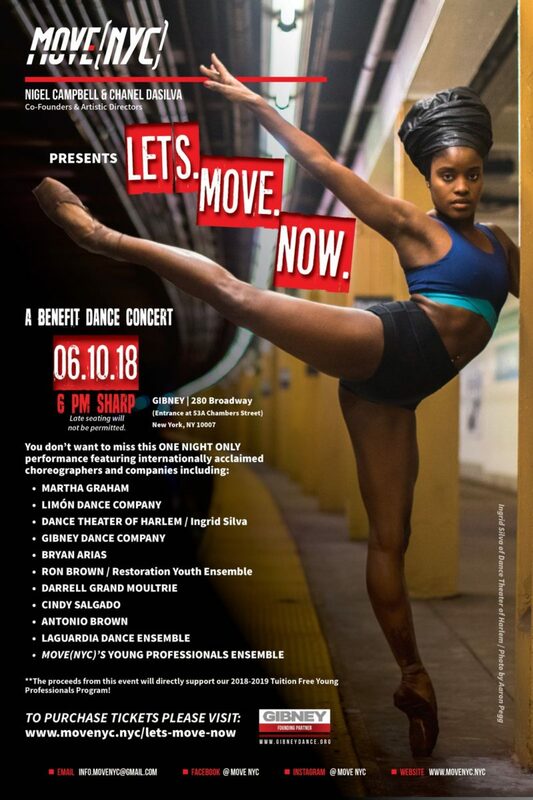 Join MOVE(NYC) for our third annual LET’S.MOVE.NOW: A Benefit Dance Concert. This is our biggest event of the year with a stellar performance roster, exciting silent auction and raffle goods, delicious food and drinks, and an exclusive VIP After Party with a live Dj you do not want to miss! Be in the “room where it happens” or support us from afar by purchasing your ticket, making a contribution, or sponsoring a ticket so a young dancer can attend the concert! All proceeds from this event will directly support our 2018-19 tuition-free Young Professionals Program. Please consider supporting the next generation of dance leaders by making a contribution or sponsoring a ticket for young artists to attend the concert. All proceeds from this event will directly support our 2018-19 tuition-free Young Professionals Program.